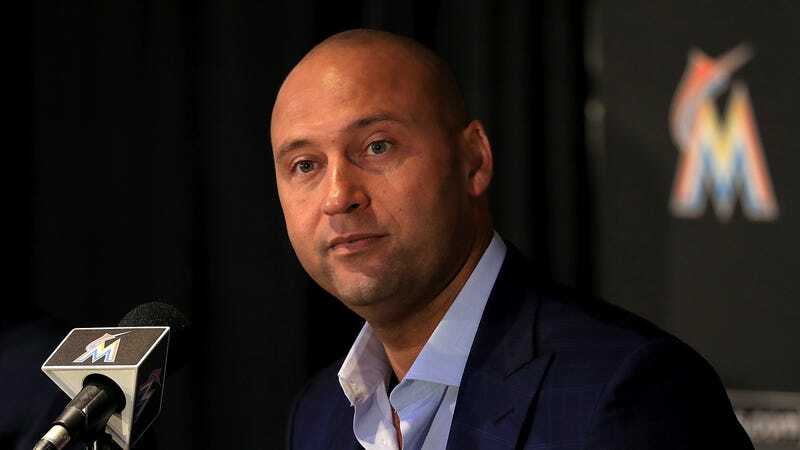 Derek Jeter Lashes Out At Questions About Marlins' Tanking; Declares Bryant Gumbel "Mentally Weak"
Here is a section of a transcript of an interview Derek Jeter did with Bryant Gumbel, set to air on HBO Real Sports on Tuesday, courtesy of the Miami Herald. I’m breaking this up into sections in part to spare your eyes the task of reading a transcript, which is miserable, but also so that we can marvel together at how baldly dishonest this exchange already is. In order to avoid answering for his team’s shameful and financially motivated anti-competitive off-season behavior, Jeter insists upon having Gumbel define tanking, as if he literally doesn’t know what it is. He does this so that he can zero in on the rough and imprecise definition Gumbel offers, in order to avoid confronting the spirit of the question. This is cowardice. Derek Jeter absolutely does not expect his team to contend. The only remotely honest answer to this question is “no.” A full answer—one that addresses itself to the actual spirit of the question, and to the perfectly valid concerns of Marlins fans and baseball fans and fans of respectable labor practices—would include that the Marlins organization is focused on making their baseball operation as cheap as they can get away with so that their new ownership group can more quickly get out from under the mountains of debt taken on in order to purchase the team. Derek Jeter is for sure not delusional. Instead, he’s a disingenuous sack of crap.